Our class teacher is Mrs Coulson. Our class teaching assistant for the autumn term is Miss Gartside. We try where possible to choose our topics around the children's interests, sometimes this may range from a one off session, to a series of sessions or may run for a longer period of time, depending on the interest and enthusiasm of the children. Previous topics have included: Pirates, Castles, Super heroes, Deadly Dinosaurs, All about Me, All Creatures Great and Small, Space, Mini Beasts, Green Fingers, Amazing Materials. Our reading mornings have been a huge success and it is lovely to see lots of mums, dads and grandparents sharing books with the children. Your child is now bringing home reading books. Please feel free to change them during morning reading sessions, whenever you feel your child is ready for a new book (reading each book a few times is very beneficial) Please make a note in your child's reading record, each book your child reads will go towards house points for their house and count towards certificates. Log in details for our online reading books 'Bug Club' can be found inside the cover of your child's reading record. The children have started their daily phonics sessions and are keen to practise the new sounds that they have been learning. During the next few weeks you will also receive a password for Learning Book which is our online learning journey. Here you will be able to keep up to date with your child’s learning and add comments and share moments from home. Your child will need a PE kit and Forest School kit. Please remember to label all belongings, so we can return them to their correct owner! 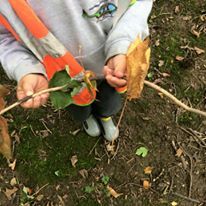 Forest School will be every Friday afternoon.